HTML is used to create webpages. HTML used many tags to make a webpage. So it is a tag based language. The tags of HTML are surrounded by angular bracket. It can use wide ranges of colors,objects and layouts. Very useful for beginners in web designing field. HTML is the basic language to learn for web technologies. It is quite easy language to learn. One more advantage is we can integrate many languages with HTML. Some of them are PHP, java scripts like node js and many more. HTML is that it is easy to code. HTML also allows the use of templates, which makes designing a webpage easy. Its plain text so is easy to edit. Its also fast to download (text is highly compressible). Is very easy to learn. Its supported by most browsers across most if not all platforms. Simple to edit, only requires a text editor. Can be used to present just about any kind of data. Tags can be used very loosely (i.e. used to be able to omit end tags etc). The main dis-advantage of using html is that it is not responsive. Just using the tags of HTML will not be useful to make a complete website. Even If you want to build a static website, this HTML will not be much effective because it will not be fit to any type of screen resolution(NOT RESPONSIVE). So for this case we are using BOOTSTRAP to make our website responsive. Here we get one more advantage, that even for using BOOTSTRAP we need to learn HTML. 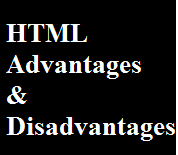 According to my knowledge, these were the advantages and dis-advantages of using HTML. The time it takes to choose the color scheme of a page and to create lists, tables and forms. It is static needs to be manually updated or needs some scripting support to change it in some way. Isn't rendered correctly in all browsers. Isn't really as flexible as other standards or technologies. Its not centralized (all pages must be edited individually). Its essentially massively outdated (xhtml and xml suite of standards). Different vendors added (mostly Microsoft early on) their own custom tags that aren't widely supported if at all by most browsers (e.g. marquee tag).